autocorr(y) plots the sample autocorrelation function (ACF) of the univariate, stochastic time series y with confidence bounds. autocorr(y,Name,Value) uses additional options specified by one or more name-value pair arguments. For example, autocorr(y,'NumLags',10,'NumSTD',2) plots the sample ACF of y for 10 lags and displays confidence bounds consisting of 2 standard errors. acf = autocorr(___) returns the sample ACF of y using any of the input arguments in the previous syntaxes. [acf,lags,bounds] = autocorr(___) additionally returns the lag numbers that MATLAB® uses to compute the ACF, and also returns the approximate upper and lower confidence bounds. autocorr(ax,___) plots on the axes specified by ax instead of the current axes (gca). ax can precede any of the input argument combinations in the previous syntaxes. [acf,lags,bounds,h] = autocorr(___) plots the sample ACF of y and additionally returns handles to plotted graphics objects. Use elements of h to modify properties of the plot after you create it. Description: "ARIMA(0,0,2) Model (Gaussian Distribution)"
Compute the ACF for 20 lags. Specify that yt is an MA(2) model, that is, the ACF is effectively 0 after the second lag. bounds is (-0.0843, 0.0843), which are the upper and lower confidence bounds. The ACF cuts off after the second lag. This behavior is indicative of an MA(2) process. 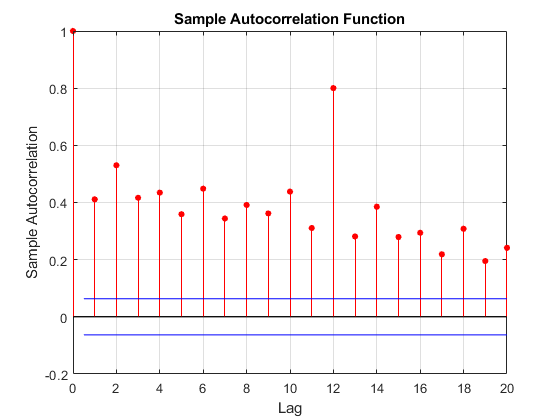 Plot the default autocorrelation function (ACF). Plot the ACF for 40 lags. 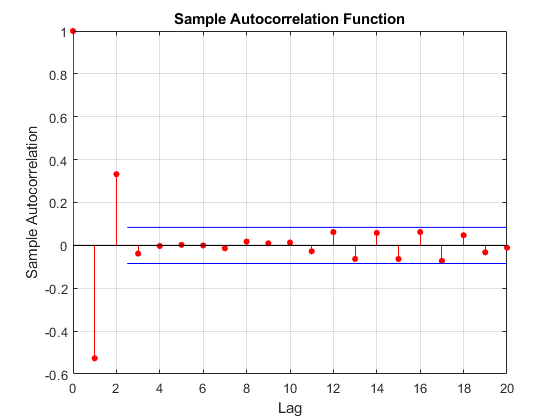 Although various estimates of the sample autocorrelation function exist, autocorr uses the form in Box, Jenkins, and Reinsel, 1994. In their estimate, they scale the correlation at each lag by the sample variance (var(y,1)) so that the autocorrelation at lag 0 is unity. However, certain applications require rescaling the normalized ACF by another factor. Simulate 1000 observations from the standard Gaussian distribution. Compute the normalized and unnormalized sample ACF. Compare the first 10 lags of the sample ACF with and without normalization. Observed univariate time series for which MATLAB estimates or plots the ACF, specified as a numeric vector. The last element of y contains the latest observation. Specify missing observations using NaN. 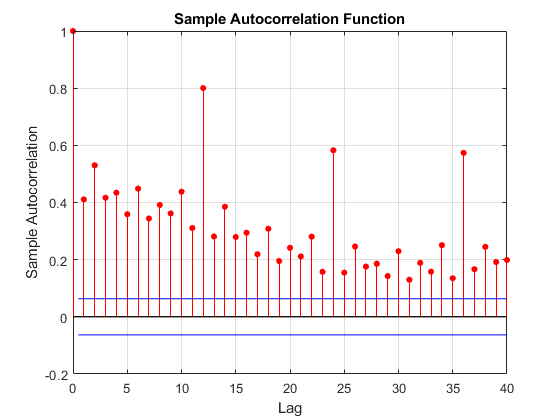 The autocorr function treats missing values as missing completely at random. By default, autocorr plots to the current axes (gca). Example: autocorr(y,'NumLags',10,'NumSTD',2) plots the sample ACF of y for 10 lags and displays confidence bounds consisting of 2 standard errors. Number of lags in the sample ACF, specified as the comma-separated pair consisting of 'NumLags' and a positive integer. autocorr uses lags 0:NumLags to estimate the ACF. Example: autocorr(y,'NumLags',10) plots the sample ACF of y for lags 0 through 10. Number of lags in a theoretical MA model of y, specified as the comma-separated pair consisting of 'NumMA' and a nonnegative integer less than NumLags. autocorr uses NumMA to estimate confidence bounds. For lags > NumMA, autocorr uses Bartlett’s approximation  to estimate the standard errors under the model assumption. If NumMA = 0, then autocorr assumes that y is a Gaussian white-noise process of length n. Consequently, the standard error is approximately 1/T, where T is the effective sample size of y. Example: autocorr(y,'NumMA',10) specifies that y is an MA(10) process, and plots confidence bounds for all lags greater than 10. Number of standard errors in the confidence bounds, specified as the comma-separated pair consisting of 'NumSTD' and a nonnegative scalar. For all lags > NumMA, the confidence bounds are 0 ±NumSTD*σ^, where σ^ is the estimated standard error of the sample autocorrelation. Example: autocorr(y,'NumSTD',1.5) plots the ACF of y with confidence bounds 1.5 standard errors away from 0. Sample ACF of the univariate time series y, returned as a numeric vector of length NumLags + 1. The elements of acf correspond to lags 0,1,2,...,NumLags (that is, elements of lags). For all time series y, the lag 0 autocorrelation acf(1) = 1. Lag numbers used for ACF estimation, returned as a numeric vector of length NumLags + 1. Approximate upper and lower autocorrelation confidence bounds assuming y is an MA(NumMA) process, returned as a two-element numeric vector. The autocorrelation function measures the correlation between yt and yt + k, where k = 0,...,K and yt is a stochastic process. c0 is the sample variance of the time series. If the series is completely random, then the standard error reduces to 1/T. To plot the ACF without confidence bounds, set 'NumSTD',0. If y is a fully observed series (that is, it does not contain any NaN values), then autocorr uses a Fourier transform to compute the ACF in the frequency domain, then converts back to the time domain using an inverse Fourier transform. If y is not fully observed (that is, it contains at least one NaN value), autocorr computes the ACF at lag k in the time domain, and includes in the sample average only those terms for which the cross product ytyt+k exists. 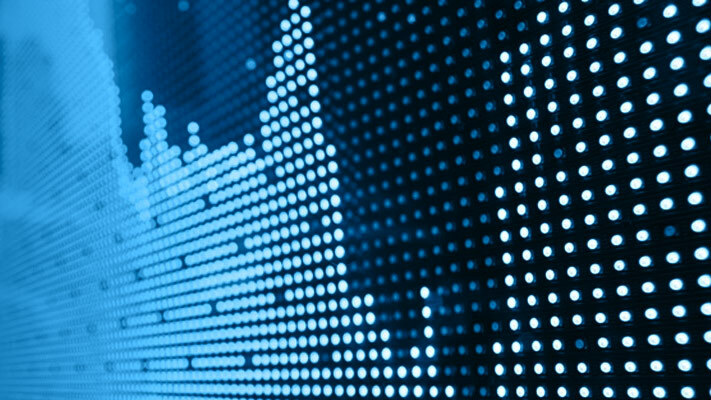 Consequently, the effective sample size is a random variable. autocorr plots the ACF when you do not request any output or when you request the fourth output.